I can remember so many discussions from years gone past about auras and how bad it feels when you enchant something which later gets killed. I’ll admit that some aura decks will be wary of the fact that Journey to Eternity doesn’t grant a power and toughness bonus, but that would be a little much considering what it potentially turns into. Repeated reanimation is pretty crazy no matter how it’s costed or what it comes on – consider that Hell’s Caretaker, which doesn’t read like much compared to some modern creatures, is quite playable in casual formats – and both sides fit very well with the sorts of comes-into-play-heavy decks that seem to be all the rage in modern Magic. Even if the only thing that happens is that it makes your opponent reluctant to kill the creature enchanted with Journey to Eternity, that’s not so bad. PSA: The card specifies creatures YOU control. Don’t try to enchant your opponent’s creature then kill it in a roundabout way to take control the creature. It will only result in you getting a loss at the pre-release. 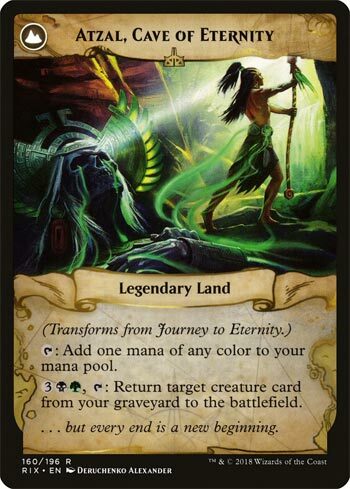 Journey To Eternity is my least favorite of the Rivals flip enchantments. My complaints are shallow though, being that it doesn’t really do anything. No exciting boosts or card advantage here, just a flip condition that’s pretty easy to achieve in Golgari. The targets to enchant are plentiful. You can get a second win out of any ETB or death triggers, or you can just keep your Commander safe. As mentioned this card can easily flip the turn you cast it, so its up to you to decide which side is more valuable. 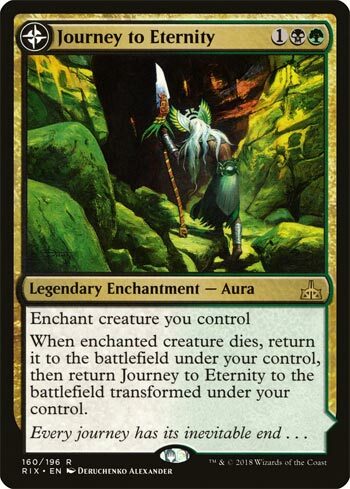 Atzal, Cave of Eternity on the other hand is my favorite Rivals flip land. Being able to ad any mana is a nice touch, but its not the main focus point. As we talked about with God-Pharaoh’s Gift the ability to revive creatures in the late game is huge swing in tempo. Six lands is a big investment but it’s worth it when you top deck a dead card or the creature you are reviving costs 7+ mana. Heck, one time I sacrificed a creature to Grim Backwoods and then revived it with Atzal. 11 mana for a single card draw. Worth it. As oft I do with these flip lands, let’s start with the flip side: reanimation on a stick. Five mana to reanimate a creature is a steep cost…but you can do it *every turn*. Repeating recursion is the most powerful kind of recursion, and the colors this would slot into lend themselves well to loading up the graveyard with creatures. It’s an expensive finisher, but it’s a powerful one, and it helps fix your mana before it comes online. The flipside, Journey to Eternity, actually is pretty good otherwise. It’s three mana for a one-shot Gift of Immortality; it folds to graveyard hate and exile effects, but it actually balances out the usual issues Auras have (getting popped too quickly). I think Atzal, and the aura that turns into it, are solid; whether or not they have a deck to play with in Standard is the question, but it seems on the cusp of being good.